1/26: My Mountain Serenade Close Up. Sometimes we need a touch of luxury, a mountain view and a little solitude in order to give our hectic lives a break. 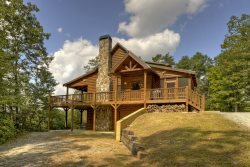 If this is what you long for, then My Mountain Serenade is the cabin for you. There are so many wonderful assets offered here that you may not want to leave at all. Whether you prefer to cook in the upgraded, well stocked kitchen, watch a game on one of the 5 HD TVs, enjoy one of 2 fire places in the cabin, soak in the new luxurious hot tub, or sit outside by the fire pit, we are sure you will be totally satisfied at My Mountain Serenade.